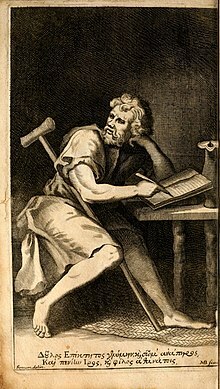 Epictetus was an Ancient Greek philosopher. He was born in Hierapolis, Phrygia around 55 AD. The name his parents gave him is unknown; the word epíktetos (επίκτητος) in Greek simply means "acquired." He spent his youth as a slave in Rome to Epaphroditos, a rich freedman and secretary to Nero. The city was near the modern-day town of Pamukkale in Turkey. He died around 135 AD in Nikopolis in Epirus, in Greece. He was one of the most influential philosophers of the late Stoa. Epictetus founded a school of philosophy, where he also taught. None of his writings survive, but one of his pupils, Arrian, wrote what Epictetus taught. Philosophy, Epictetus taught, is a way of life and not just a theoretical discipline. To Epictetus, all external events are determined by fate, and so are beyond our control; we should accept whatever happens calmly and dispassionately. However, individuals are responsible for their own actions, which they can examine and control through rigorous self-discipline. ↑ His year of birth is uncertain. He must have been old enough to teach philosophy by the time Domitian banished all philosophers from Rome ca. 93 AD. He also describes himself as an old man to Arrian ca. 108 AD. cf. Discourses, i.9.10; i.16.20; ii.6.23; etc. ↑ He was apparently alive in the reign of Hadrian (117–138). Marcus Aurelius (born 121 AD) was an admirer of him but never met him, and Aulus Gellius (ii.18.10) writing mid-century, speaks of him as if belonging to the recent past. This page was last changed on 2 December 2018, at 00:32.